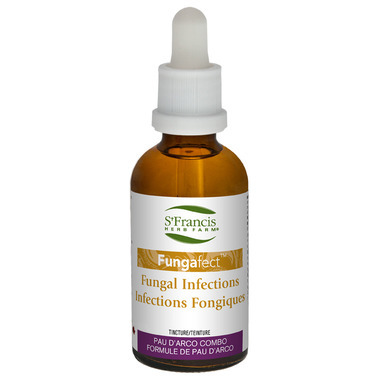 As an antifungal, Fungafect is effective for the treatment of fungal infections like Candida albicans, whether of a systemic nature or localized, as in the case of thrush or vaginitis. Suggested Usage: Adults: 0.7-2.5 ml (20-75 drops) 3-4x daily in a little water on an empty stomach. Cautions and Warnings: Consult a health care practitioner before use if you have been diagnosed with a medical condition or if you are taking prescription medication. This supplement is so hard to take but I LOVE the benefits. I have had athlete's foot since I was 10-11 years old (my dad had it too). I've tried everything - stuff you buy over the counter at the drug store, oil of oregano & teatree oil between my toes. eventually nothing worked. i was introduced to this supplement by a person who works at my favourite health food store and within 2 days of taking this, my feet stopped stinking (I can now take my shoes off without offending anyone!). this has been a problem for over 20 years now. I also noticed the severe dandruff I have is easing up and my pillow is not covered in the morning anymore. I will continue to take this amazing supplement! fantastic product ..... it taste awful and it works. The taste is so awful I still have trouble taking it more than once a day! It should come in a pill!